I must confess that I have been getting caught up in all this positive praise and have slipped away somewhat (at times) of my main objective here. I have been on certain days “trying” to capture images that are my all time favorites, every single day. I have also been looking at my work and thinking “I wonder if they will like it?” So guilty as charged. So I have managed to catch my ego here. And instead of “trying” I am returning to just “being”. And instead of trying to capture the brilliant shot everyday, I am returning to do what I love, taking photos, being in the moment and enjoying one of my passions. So this photo is nothing amazing, just a local Gas station that I walk by around the corner from my house. The only thing that doesn’t make this photo look old is the Gas Prices. When I cam to the USA, 10 years ago, prices were $1.50! But I am having fun with my iPhone and the editing software. I enjoyed this one. Thanks to all of you for following, comments and helping me to be true. Isnt it true how with the 365 one starts out trying to nail one every day? Sometimes the mundane can be really good…like your shot today. Thanks Angeline. So good to get your inputs and thoughts too. Great post, Mr. Todd! We all have those pesky egos, don’t we? No worries, though. It came with the territory of being human. Know what you mean. I had to change my project to 366 also. Oh well, we thank God for another day of life even if it does mean one extra photograph 🙂 Happy Leap Day to you, too! Thanks Gina. Yes and as long as we are aware of it, it means we are conscious. Cheers and thanks for all your comments and for stopping by. Hi Kenneth, love your shot, and the way you edited it. And I know exactly what you mean by taking that one amazing shot…I was wondering each day a bit more what others might think of my pictures… and without saying, just doing so… I am back to business as usual: Just taking my pictures, choose the one I like best and what others think… nice if they like it…if they don’t… no big deal! We always seem to drift towards pleasing others because as a species we have an intrinsic need to be liked / loved, so we find out how to best mold ourselves to satisfy the needs of others, and yet still leave room for our personal satisfaction … that just makes us human. I’m always surprised when I come across those individuals that do the opposite – they expect the world to accept them exactly as they are, and they do not appear to be affected one bit when the people around them reject them at every turn. Finding a balance can be tricky, but again, that’s just part of being human. Not to add fuel to the fire, but as much as your photography drew me to your blog, I think, (in my case), it was more about the writing. Something about the way you chose your words keeps me interested, and curious. The photos are like the cherry on top. Hi, great images and realistic view on life. I’ve just started blogging and keep wanting people to like what I’m posting, but in a way I really started blogging to help me focus my creativity and put down all those thoughts that keep buzzing around my head before it gets overloaded. Thanks for stopping by my blog and liking it though – it is reassuring to be appreciated! No worries and thanks for stopping by. G-man…..what if there was no gas?…..would there be life? …..what if gas was life…. Gas is life. As is everything else. Drill down to the sub-atomic level of that “gas” particle and it is energy. As are our bodies, as are trees, as is everything. We are all energy. The entire universe is energy, just vibrating at different levels. Which ultimately means we are all “one” – we are all the same. Bit airy fairy right, but I believe it is true. Within each energy “particle” there is a life intelligence that cannot be observed but is there and chooses it’s form and continue to create. The station of life…..never full or empty……always moving….which station are you? I am both. Never full, never empty. I just am :-). Ahhh, I just am 🙂 This is wonderful – your photography is wonderful, but it is your words that inspire. I can see from the comments that people keep dropping by for both. Well done……you are touching souls, Ken! Thanks for sharing what apps u use. I’ve wondered how you get your photos to look like they do. Great shot, my 30 day challenge pales in comparison. Thanks for stopping by. photoblogs are really my favorites.! Yours is definitely worth a follow! Is it true that Snapseed doesn’t save the final images in full resolution? I’m enjoying your blog very much! I haven’t had that issue, but I only use it for my iPhone image editing. If you go to yesterdays post of The Cross and click on the images a couple of times within the post it will expand to huge detail. I must say their appears to be no resolution issues there, even for a handheld mobile phone. Thanks for the comments. Enjoy your music and still a novice on guitar, so good to hear folks like you. Gas stations are the bloodlife of modernity, but also an iconic place that mixes a sense of rest and energy at the same time. Gas stations are a place where horses drink oil and men drink beer. 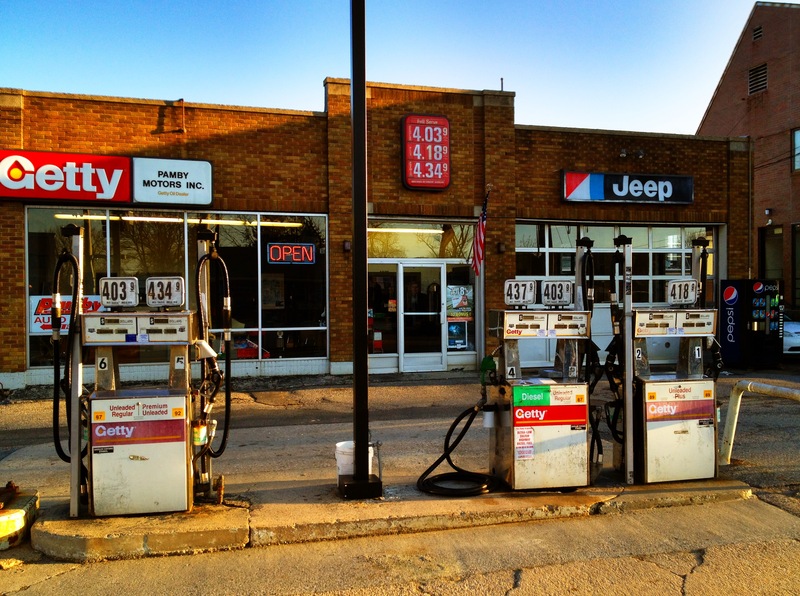 Gas stations are frozen in Hooper’s suspended paintings, air as thick as oil. 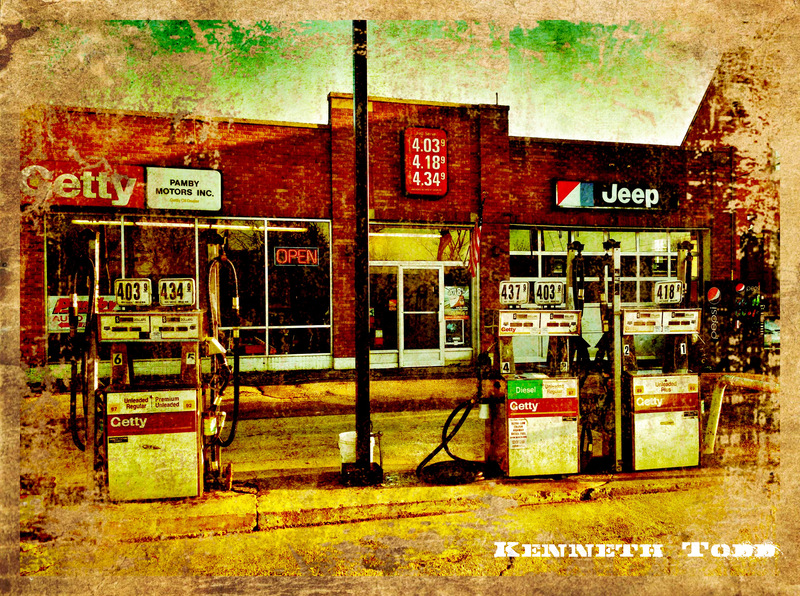 Gas stations are solitary places, the ideal set for robberies and spectacular explosions in movies and gangsters’ stories. Nice shot! I’m going to try out the pic grunger app today. You can never have enough grungy textures. Great image and cool effects. Great. Should be sending one out very soon.